It is a very important fact that speed of the website plays a very important and major role for any kind of website. A potential customer can be lost within a fraction of seconds. The internet speed is increasing at a rapid and fast rate as more and more intolerant towards a slow loading speed website. Even search engines like Google prefers a website and rank them to the top which is having a faster loading time. 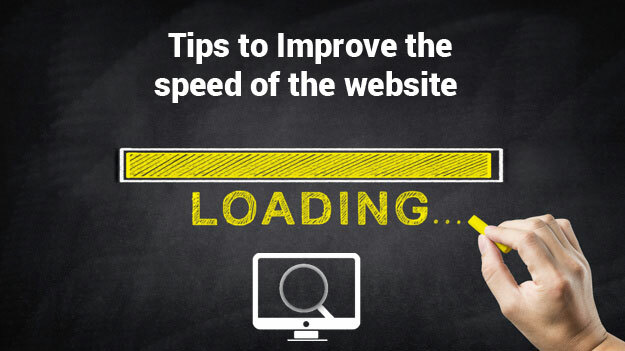 There are few methods by which you can improve the speed of the website. All these points will surely help your website to gain a good speed so that you can have a much better presence over the internet. 1. Most of the websites store information using database. If you have an online business or an online business with functionality like internal search, then your website would be using database. This database of your website can impact the loading time of your website. One of the best ways is by adding an index to the database for web speed improvements. This will help the database to find the information faster. When you add an indexing, your database can rely on an index to narrow down the data to a few hundred. This will help the data to get returned at a much faster rate. 2. Though tracking codes is one of the major and important factors. One should always remember to keep only those analytics program which is necessary. One should always remember that a simple website is the best website. Every time when you are adding another tracking code to your page it will slow it down. It's better to put the tracking codes at the bottom of the page. In this way the page can be displayed to the user even when the code has not finished loading. 3. Optimising Images is another important step to decrease the page loading time. The first important step to optimise the images is by scaling them appropriately. Most of the new website entrepreneurs use huge images for their website and then scale it down. In this case one should understand that the browser still loads the full images. The best way would be to scale the images before uploading them to the website. Another way to optimise the images is to compress them. There are many tools available online that can reduce the size of the images without losing the quality of the images. 4. Enabling the browser cache lets you temporarily store the data on a visitors computer. In this way the website visitor won't have to wait for too long when they visit the page of the website. The time period for which the data will be stored depends on the browser configuration and the cache settings. 5. Enabling the compression is like putting the website into a zip file. Compressing the website can reduce the page size and then increasing the speed. Compressing the images will help your website visitors not to download the data which they dont require. Compression can be accomplished through server settings and it can be implemented through webserver and its settings. 6. The CSS of a website loads before the website visitor can see your website. The longer it takes for the CSS to download the longer the website visitor takes for the website visitor to have a quick access. It's better to ask yourself is it required to use all the CSS? If there is no requirement you can get rid of the superfluous code in the files. The best next step would be to minimize the CSS file size. Minimizing the CSS removes the extra space ensuring that the file is of smallest size. Minimising the resource files is the best way to reduce some size of the files. These were some of the important points by which you can decrease the loading time of your website or in other words improve the speed of the website. We here at HostingRaja gives the best solutions suitable for all types of websites/businesses, so that you can choose the best and the most appropriate plan for your business needs. As you know today people don't like to wait wherever they are or whatever they do. Everything needs to be quick and spontaneous. Moreover everywhere we are we witness impatient people cutting the line. And the same thing is applied in digital life. Whenever if you are looking for a piece of information on the internet, you might check several websites in order to find it as you need a clear answer straight away. Hence it is in the businesses benefit to have a website with fast load time. Since there is huge competition there is a fight for high ranking on search engines. Because every day millions of businesses do their best in order to position their websites higher than the competition. So today if you are looking to rank better on search engines then you need to have a optimize a website which loads faster. And one of the very important factors of Search Engine Optimization (SEO) is improving website speed. As per research study it has been said that Google doesn't like slow websites and therefore, they could be penalized in ranking. Today there are millions of people who use the internet every day and have also been looking for information on the internet. This shows that the internet keeps them busy. So once users visit a website, they expect to receive the accurate information that they are looking for otherwise, they will look elsewhere. This not only affects the user experience but also, in a more complicated way, the ranking of the website. It also creates a high bounce rate, less opportunities for the content to be shared which is also an SEO factor, and Google also registers the website as irrelevant to the user's need. Each and everyone today has a smartphone and this as allows the users to access the internet via their mobile. And the main reason for users connecting online via their mobile is that they'd need information on-the-go, in other terms, as quick as possible. So making them wait for results in the same consequences as the previous point. In 2015, around 50% of online shoppers used their mobile to purchase, which also represented a promising opportunity. Therefore, building an eCommerce website with a fast load time increases conversions.